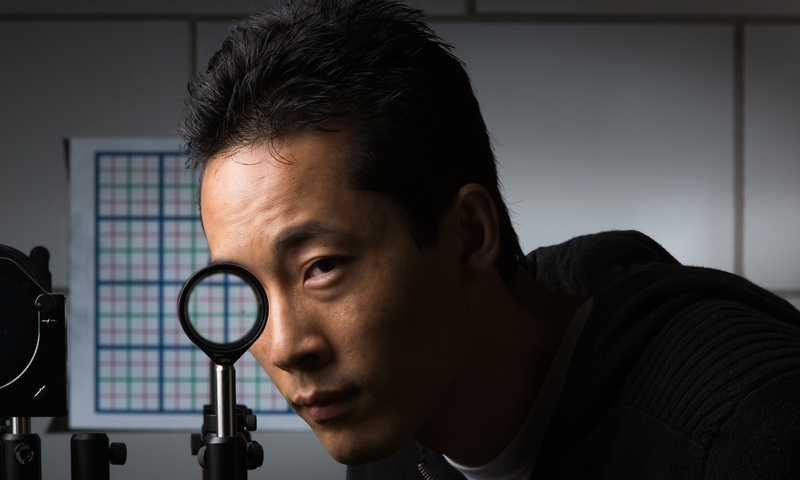 Doctoral student Joseph Choi is pictured with a a multidirectional `perfect paraxial’ cloak using 4 lenses. In a new paper submitted to the journal Optics Express and available on arXiv.org [UPDATE 11/19/2014: The paper has now been published in Optics Express], Howell and Choi provide a mathematical formalism for this type of cloaking that can work for angles up to 15 degrees, or more. 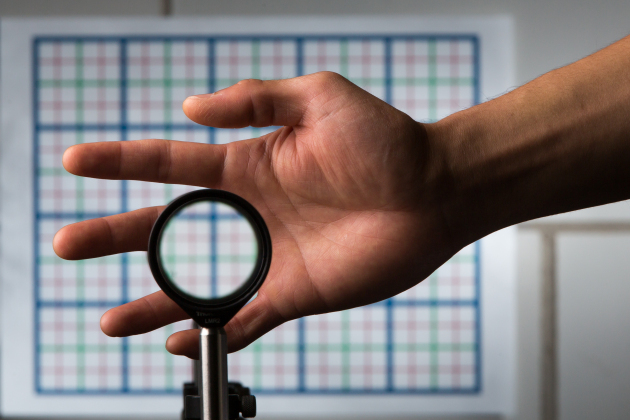 They use a technique called ABCD matrices that describes how light bends when going through lenses, mirrors, or other optical elements. Separate the first 2 lenses by the sum of their focal lengths (So f1 lens is the first lens, f2 is the 2nd lens, and they are separated by t1= f1+ f2). Do the same in Step 2 for the other two lenses. Separate the two sets by t2=2 f2 (f1+ f2) / (f1— f2) apart, so that the two f2 lenses are t2 apart. Achromatic lenses provide best image quality. Smaller total length should reduce edge effects and increase the range of angles. For an easier, but less ideal, cloak, you can try the 3 lens cloak in the paper. A patent has been filed for this cloaking device. Please contact UR Ventures for additional information.